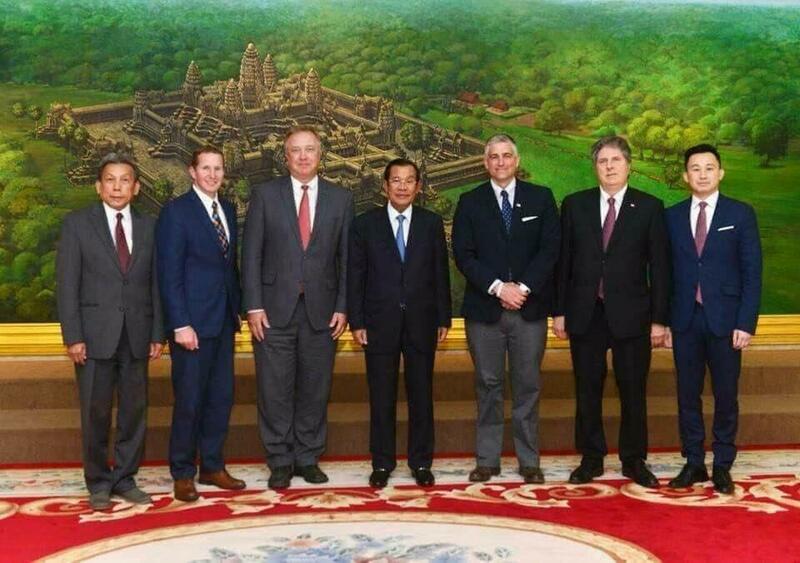 This isn’t the start of a new joke, but a description of reports out of the Southeast Asian nation that Cougar head football coach Mike Leach and three Washington lawmakers are in the Cambodian capital this week, where they met with the prime minister and other government officials. Legislative staff members back in Olympia were working Tuesday to come up with details of the trip after Sens. Mike Baumgartner and Doug Ericksen, and Rep. Vincent Buys, along with Leach, were shown in meetings with Cambodian Prime Minister Hun Sen.
“We’re just waiting for them to get back to us,” said Kimberly Wirtz, communications director for the Senate Republican Caucus. Communications were difficult because of the 14-hour time difference between Washington and Phnom Penh, and because legislators might not be checking their email frequently. It was unclear whether the lawmakers were paying for the trip themselves or traveling as guests of a private or government organization. The state is apparently not paying for the trip. Finals and spring football are over, student athletes are gone and head coaches are not allowed to be out recruiting this month under NCAA rules, Stevens said. “He’s someone who loves discovering new things. He loves to travel,” Stevens said of Leach. The coach is also a friend of Baumgartner, the Spokane Republican who is giving up his Senate seat this year to run for Spokane County treasurer. Ericksen, of Ferndale, and Buys, of Lynden, also Republicans, are expected to seek re-election this year. Ericksen has made previous trips to Cambodia. A website called Fresh News International, which carries the slogan “Breaking News on Your Hand”, reported the four met Monday with Hun Sen and 10 other dignitaries at Phnom Penh’s Peace Palace. That report says Ericksen, whom it identifies as a U.S. senator, noted Cambodia’s rapid economic growth, which he attributed to Hun Sen. The other legislators and Leach aren’t mentioned. One of the realities of Cambodia, not mentioned by the website, is that Hun Sen has cracked down on independent news media in the country, closing some newspapers and radio stations through heavy taxation. The government has also “dissolved” an opposition party and jailed some of the party’s leaders ahead of elections in July. Fresh News reported the legislators met Tuesday with agriculture officials about the prospects of increased trade between Cambodia and the United States. Based on the photos of the participants, Leach skipped that meeting.